Chicken Binakol is a native dish of Iloilo. 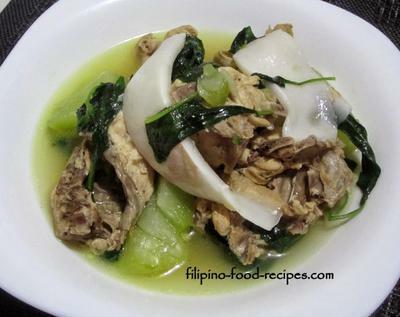 If you try this dish, you would say that this is just an ordinary Chicken Tinola. Yes, it’s a chicken tinola but with a twist….. a slightly sweeter version because of the addition of fresh coconut water and coconut meat to add more flavor. The preparation is almost the same as the regular Tinolang Manok, saute some onion, garlic, ginger in oil, add the chicken until brown, the add the chayote……. and lastly, the coconut water and coconut meat. 1. Saute garlic, onion and ginger in oil. 2. Add cut up chicken pieces and stir fry to slightly brown. 3. Add the fish sauce, then the chayote. 4. Add the broth and water. 5. Bring to a boil and cook until chicken is tender. 6. Add the coconut water and let it boil again. 7. 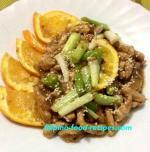 Add the coconut meat and sili leaves. Serve hot with rice.